Xiria switchgear is a new generation of environmental friendly Ring Main Unit switchgear for application in 12-24 kV medium voltage distribution networks. Sustainability becomes more and more important, this criterion has been taken as a starting point for the design in terms of production and for the entire service life of the switchgear. The system is metal enclosed and air insulated, equipped with load-break switches and circuit breakers for 12kV-20 kA and 24 kV-16 kA networks. The nominal current of the load break switch is 630 A. The nominal current of the circuit-breaker is 200 or 500 A. The mechanism can be provided with motor operation for remote closing and tripping in automated networks. The vacuum interrupters, the main busbars and the change-over/earthing switches are mounted inside a fully sealed metal enclosure for protection against the ingress of moist and dust. The ON/OFF position of the main vacuum interrupters and the position of the integrated earthing are clearly visible through inspection windows at the front. 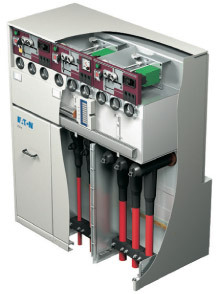 Xiria switchgear can be completely recycled after it's service life. No harmful materials are used and the used insulating materials are provided with a international recycling logo for easy recognition.